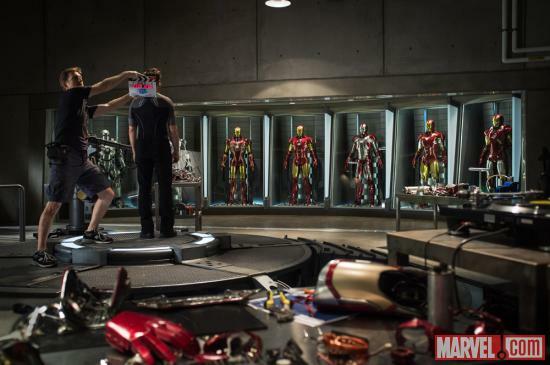 Marvel has released the first picture from the Iron Man 3 set which includes the full line up of armor from mark 1 to 7 as Tony Stark stands in front. This picture was released to let fans know that even though the battle from Avengers is over the battle is only just beginning. Although the picture will excite fans I feel many will be left with plot hole questions such as, wasn’t the mark 1 armor partly blown up in the first movie. And didn’t Mark 2 get converted into War Machine? So far the Iron Man 3 release date has been confirmed as a May 2013 release. It’s also worth noting that we will likely see Robert Downey Jr gearing up for a fourth and firth Iron Man movie over the next few years. The picture also leaves a question as where was it taken? Filming was thought to have begun in North Carolina but with the Disney China input and influence on the awesome cast Tony Starks lab could be filmed anywhere.